Please register in advance for all classes, so that the instructors can plan for adequate supplies. Constructed using 3 hoops, this is a fun (and can be a challenging basket). You will gain experience with adding ribs, working on a frame, and weaving with a variety of materials for texture and color. Bring some rocks or beads to make this your own creation if you desire. 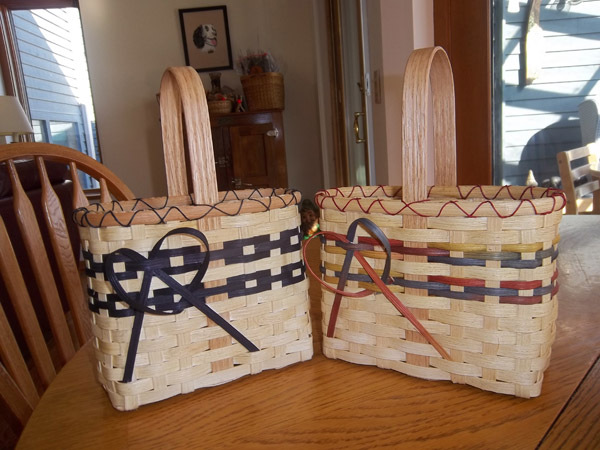 Created by Della Pleski, inspired by an unsigned basket bought at a rummage sale. Regular basket tools (bucket for water, towel, scissors, awl, and clothespins) and your own rocks/beads to add if you want to. Discover the subtle beauty of Finn Wool in its natural earthy colors. Known for its luster and excellent felting capabilities, Finn is the perfect wool for strong, sculptural vessels and bowls. 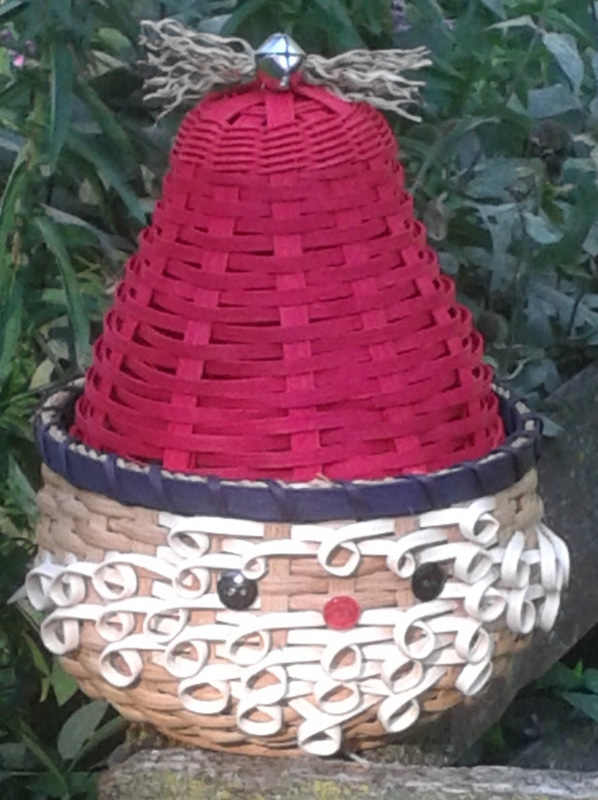 Try something new, basket weavers! Learn the fascinating art of 3-dimensional seamless wet felting and a variety of wool sculpting techniques. Bring to class: 2-3 hand towels, an old bath towel, sharp scissors and a plastic bag to carry home wet items. Optional: apron. 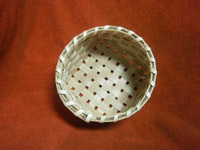 This beautiful ‘basket’ is made by coiling the bottom with waxed linen, available in a variety of colors. 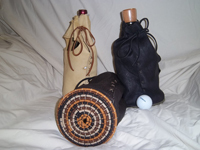 The top part of the bag is made with genuine deerskin, also available in a variety of colors/dyed deer leather. If you have never coiled, you will learn how in this class. 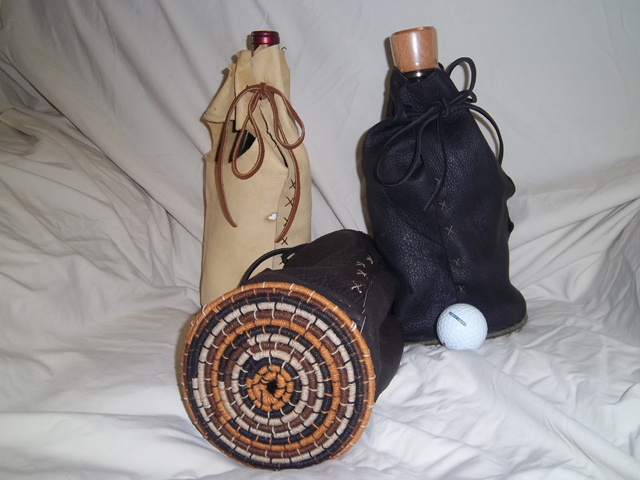 Adding the deerskin creates a unique one of a kind wine bag. 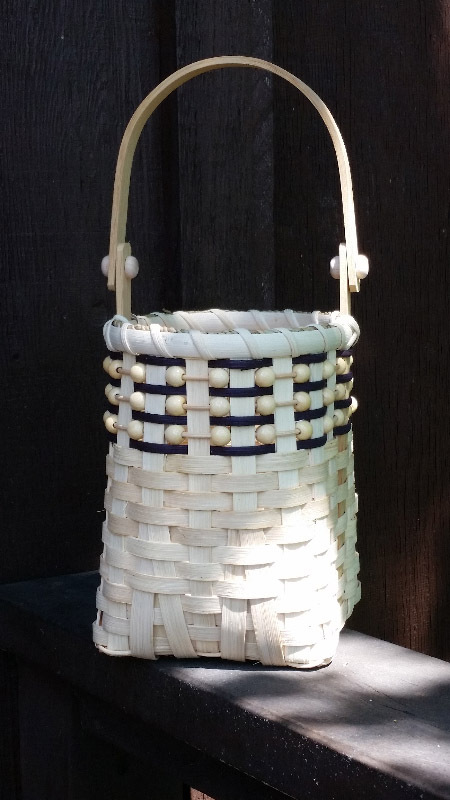 This will be offered again next month due to the time needed to complete this basket for a total of two classes. 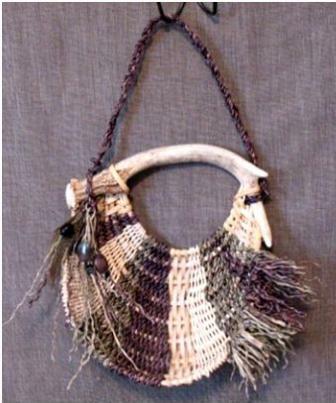 Diameter of 5.5" and height of 9"
Beads and weaving! What a great combination! This is a fun and simple tote, useful to carry beverages or whatever as a container or as a vase. 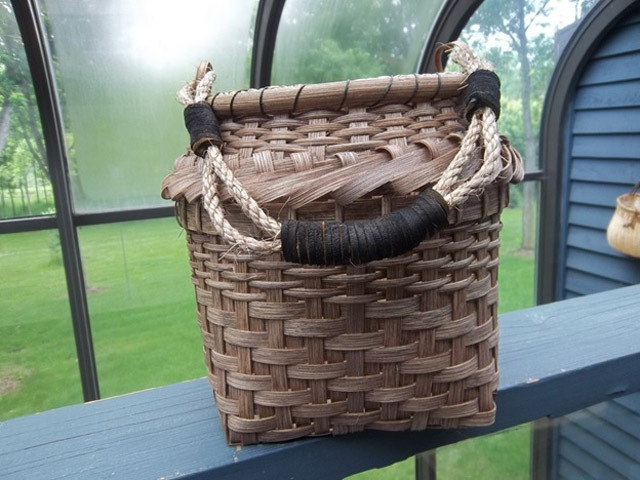 It features a filled bases, a D-swing handle, colored reeds, and lots of beads! Color choices are available. Fast, easy project with a 3D touch. Perfect place for cards, napkins or whatever you like. 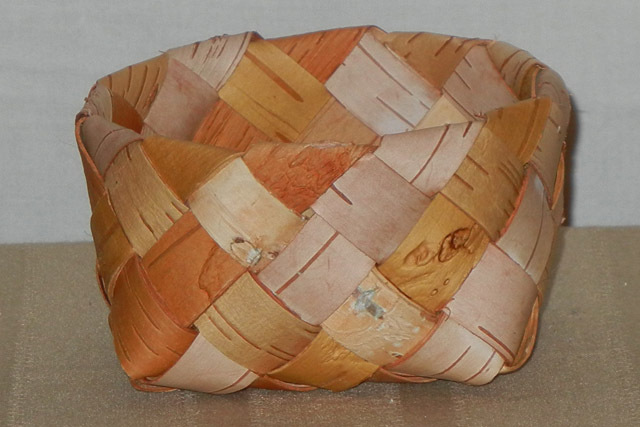 Our apologies - the Birch Bark Candy Dish class by Phyllis Knutson for today has been cancelled. The following class has been scheduled in its place. This is a free-form with no right or wrong. 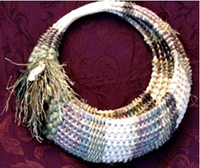 A variety of materials to interweave, including dyed and plain seagrass, Pakistani grass, jute, sisal, natural and dyed reed, palm inflorence, coco fibers, corn husk, honeysuckle, or whatever else is around. It's about texture and different color combinations! Also materials to "accent" the basket will be available, but if you have beads, rocks, feathers, bring them! Antlers will be pre-drilled and some spokes in place. 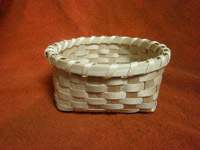 Learn the Scandinavian Double Diagonal weave for the Birch Bark Candy Dish. 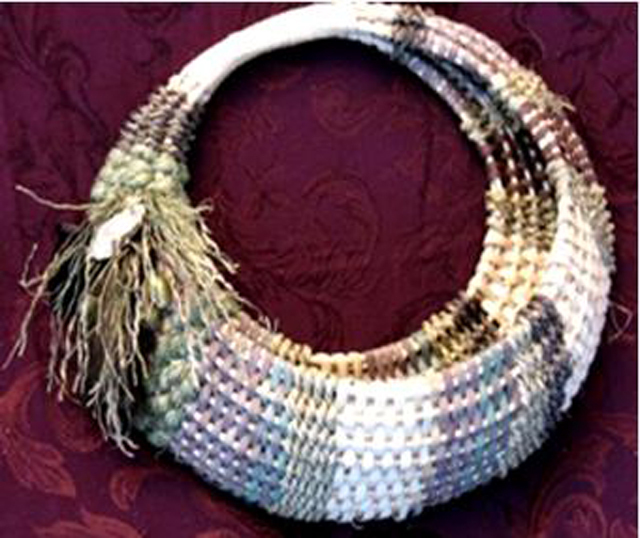 Once you learn the weave you can make many different styles of items. We will learn on a couple strips of the bark how to thin it for weaving but your supplies will be thinned and ready for weaving. 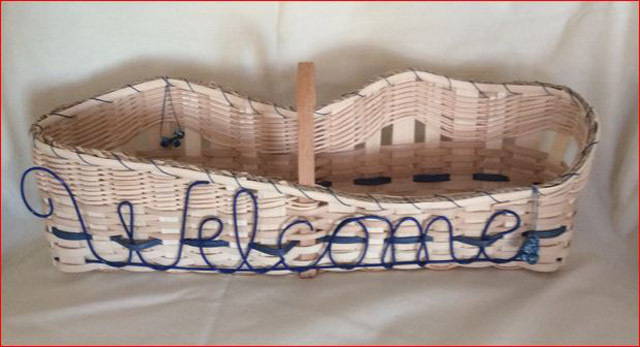 This reed basket is all about the three rows of double crossed knots. Start on an oak base with a narrow slot, eliminating the need to twine in the spokes. Stop/start weaving takes you up the sides. Shaping to get the gentle flare is the challenge. The three rows of fancy double-crosses are woven with bleached cane. The spokes are glued to the rim. 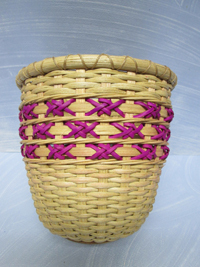 Finish with half-round and flat oval rim bands filled with round reed. Lash with waxed polyester cord. Start this round bowl on a wood base with a narrow slot, eliminating the need for twining. 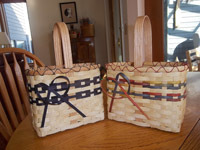 Learn to set up the chase weave by starting weavers on opposite sides of the base. You’ll never even see the start. 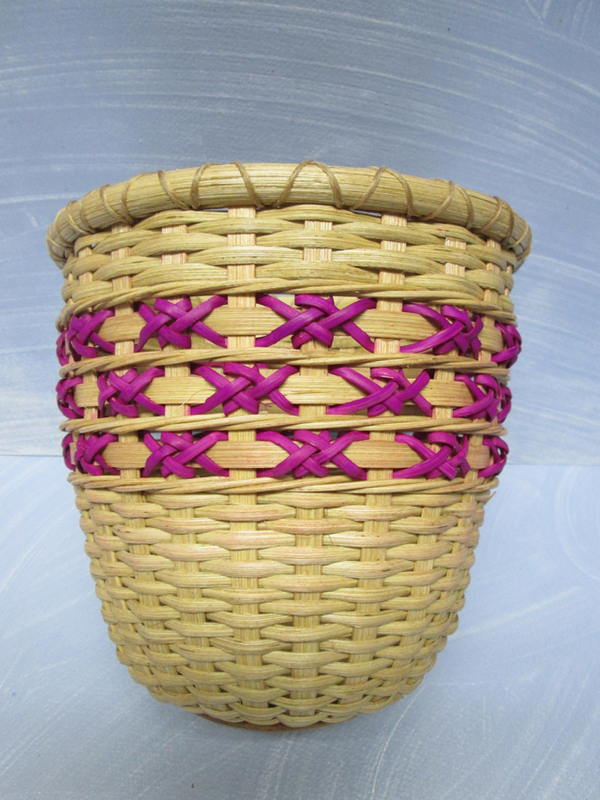 Double spoke with dyed chair cane, and weave continuously. The spokes continue to the top and are then woven into the dynamic 3-stroke braid pattern. No scarfing, no lashing, just a beautiful rim. 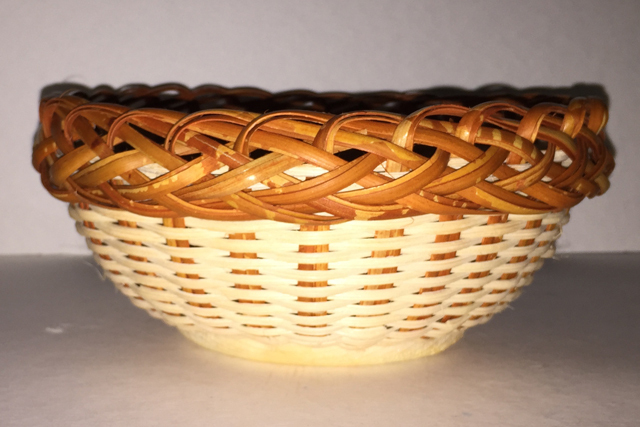 A simple and elegant basket. 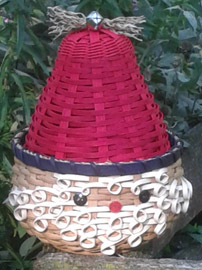 This cute santa starts with a 5” wooden base and has many fun weaving techniques. We will be using smoked reed for the head and dyed reed for his adorable hat. There is a twined rim to hold his hat in place. The challenge is fitting his hat inside the rim, but the fun is no 2 hats come out alike. His adorable curled beard is very fun to do and he is finished off with a button nose and eyes and a bell on the top of his hat. Once you have him sitting in your house, your friends and family will all be wanting one! Many choices of colors and matching vintage glass beads. Lots of techniques to learn and use. This is truly a fun basket to weave and let your creative juices flow! 16" x 3.5"